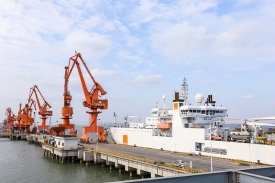 On November 26, HENGTONG also released a number of new products including submarine equipment fitting stations, a stereo intelligent anchor observation system, two-stage composite cables for application to marine disasters prevention pre-warning networks, an environmental monitoring system for port and wharf, as well as underwater oil and gas production and monitoring system, demonstrating HENGTONG’s technology, quality, production and delivery capability. To realize the global connection, submarine cable plays a critical role in global ocean communication and energy interconnection similar to the human central nervous system. As a global leading communications and power cable service provider, HENGTONG is committed to developing and integrating marine communications and power transmission technologies and systems. In the past five years, HENGTONG has built a global-leading submarine optical cable R&D production base including a system integration, testing center, and a dock cabling system, developing to be one of the leading submarine optical cable companies both at home and abroad.